As the year starts to wind down, so do the number of races I have left to qualify for the 2012 ING MYC Marathon. Having procrastinated with the races during the year, I run up to December needing to complete my 9+1 for automatic entry into the marathon. The Join the Voices race to benefit brain cancer research was my latest race, and one I knew I wouldn’t do well from the start. When I woke up 45 minutes before the race, I knew there was a problem. I had slept through my alarm clock and had to race to get ready and get to Central Park. I sped down the highway into New York City and just barely made it after the race started. Unfortunately, the other complication is that I had picked up my friend Jocelyn’s race bib, so she was forced to wait for my arrival before she could run as well. For that I am supremely sorry, but Jocelyn was nice enough to forgive me once she finished the race. 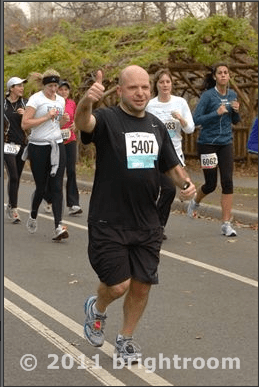 Having forgotten my iPod and Nike+ GPS watch, I had no clue how I was doing on the course, but having run to my car then run to the race, I knew I wasn’t going to do as well as I usually did. Even with the late start, I thought I was moving pretty well along the race path. Unlike the previous week’s four mile race, we didn’t start out running uphill and the course wasn’t too bad until I reached mile 3, where there were two hills and the fatigue of the morning started to set in. I was forced to slow down running up those hills, but I was able to run the race to completion. My time was 50:39, with an average pace of 10:08, a pace I normally have for longer race, like half marathons, but all that matters to me is that I was able to get there in time and run it to count for next year. With one more race to go next weekend, I’m looking forward to finishing out my racing season and getting ready for 2012. Can’t wait to run next weekend with bells on. Literally.